IST was hired by a large petroleum bulk storage and lubricating oils company to help the facility come into compliance with Oil Spill Prevention Control and Countermeasures (SPCC) regulations. The scope of services included designing a soil assessment and remediation strategy, designing an impervious cap in the lubricating oils tank field , designing improvements to the oily storm water drainage system, and managing the construction. The soil assessment characterized the soils to a depth of 3 feet in the tankfield to demonstrate decreasing soil impacts (BTEX, PAH, and TPH) with increasing depth. This strategy helped IST to justify leaving less impacted soil in place, thereby minimizing disruption to the numerous tankfield constraints, including 50 base oil tanks and ancillary equipment . 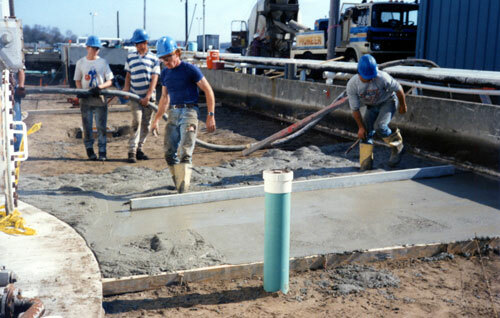 Soil remediation consisted of machine and hand excavation, associated thermal treatment, and soil capping with sealed fiber-mesh concrete that conformed to the site’s numerous physical features. Drainage inside the diked area was accomplished by a series of shallow pipes through catch basins connected by PVC sewer pipe. Automated oil skimming equipment was incorporated into existing drainage sumps to reduce loading on the oil-water separator system, thus improving NPDES compliance and minimizing oily water emulsion disposal costs. IST prepared the bidding packages, facilitated contract negotiation, and inspected the construction, acting as the oil company’s authorized agent throughout the construction and asbuilt process. Final project costs were approximately one-half that anticipated by the oil company to come into full compliance with the South Carolina Department of Health and Environmental Control SPCC audit requirements. Once implemented, the facility’s SPCC plan was updated to include the improvements.